Paxil was approved for use in the United States in 1992.
he New York State attorney general accused the British drug giant GlaxoSmithKline of consumer fraud today, asserting that the company had withheld negative information and misrepresented data about the efficacy and safety of prescribing the antidepressant drug Paxil to children. The civil lawsuit, filed in New York State Supreme Court, says that starting in 1998, Glaxo suppressed the results of four studies that did not find the drug effective in treating children and adolescents and that suggested a possible increased risk of suicidal thinking and acts. "By concealing critically important scientific studies on Paxil, GlaxoSmithKline impaired doctors' ability to make the appropriate prescribing decision for their patients and may have jeopardized their health and safety," the attorney general, Eliot Spitzer, said in a statement. 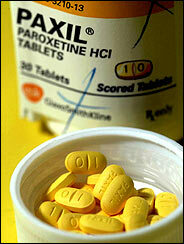 Paxil has been approved by the Food and Drug Administration for the treatment of depression in adults. Prozac, which is manufactured by Eli Lilly & Company, is the only antidepressant that has been approved to treat depression in children. However, doctors have professional discretion to prescribe Paxil for treatment in children, a so-called "off label" use. Doctors routinely recommend antidepressants for children suffering from depression and other psychological disorders. A recent study sponsored by the National Institute of Mental Health found that Prozac was more effective than psychotherapy in treating depression among teenagers and that the two treatments together yielded the best results. In April, a European Union advisory panel recommended that Glaxo strengthen warnings about severe withdrawal symptoms when patients stop taking Paxil. European Union regulators also recommended that Paxil not be given to children because clinical trials had found the drug to be associated with increased risk of suicidal behavior and hostility. In this country, the Food and Drug Administration has recommended caution in prescribing Paxil in children and adolescents for the treatment of major depressive disorder, and is currently conducting an analysis of the data related to the use of Paxil in children and adolescents and the possibility of increased suicidal thoughts. In a statement, Glaxo said it "has acted responsibly in conducting clinical studies in pediatric patients and disseminating data from those studies." "All pediatric studies have been made available to the Food and Drug Administration and regulatory agencies worldwide," the company said. "We have publicly communicated data from all pediatric studies." In the lawsuit, Mr. Spitzer asserts that an internal GlaxoSmithKline document from 1998 showed that the company intended to "manage the dissemination of the data in order to minimize any potential negative commercial impact." In its statement, Glaxo said that "as for the 1998 memo, it is inconsistent with the facts and does not reflect the company position." According to the lawsuit, Glaxo's revenue for Paxil prescriptions in children and adolescents totaled $55 million in 2002. Mr. Spitzer, who has spent the last few years fighting fraud on Wall Street and who is widely expected to seek the Democratic nomination for governor of New York, is seeking the return of all profits from Paxil obtained by Glaxo as a result of the conduct alleged in the lawsuit. Download Today's New York Times to Your Desktop.